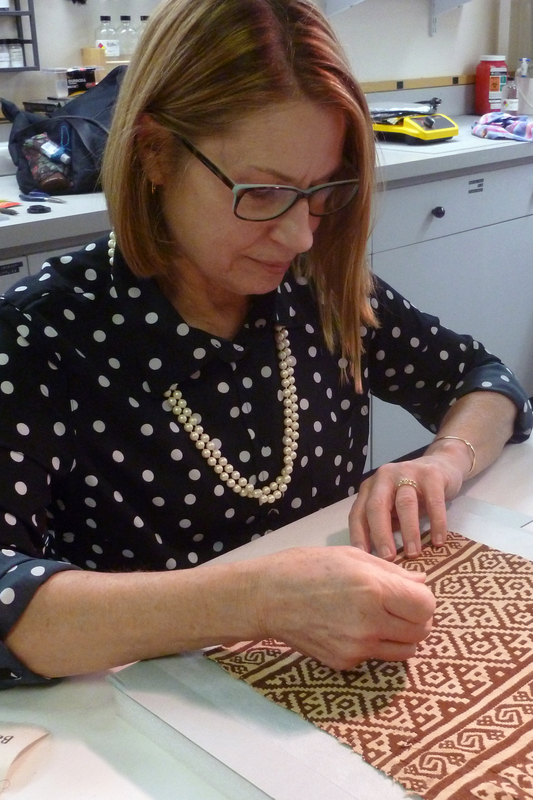 Textiles conservator Patricia Ewer consolidates stabilizes the fragile weave structure on fragment of a Chancay tapestry. Photograph courtesy of Renée Stein. With generous funding from the Bank of America Art Conservation Project, objects included in the Threads of Time exhibition were prepared for display and study. The Carlos Museum is proud to be among the 2016 recipients of this competitive grant award. Since 1993, the Carlos Museum’s Parsons Conservation Laboratory has served the diverse collections by providing both preventive care and conservation treatment, working in close collaboration with curatorial and collections staff. The conservation lab is thoroughly integrated into the museum’s mission of preserving collections and making them accessible to students, scholars, and the public. The lab is a center for interdisciplinary inquiry, conducting analysis and treatment while also providing hands-on learning opportunities for students interested in pursuing careers in art, conservation, preservation, and science. The Threads of Time conservation project included complementary components: treatment, mounting, technical examination, and analysis. Conservation-related details are summarized as “Technical Notes" in select catalogue entries. Through use, burial, and eventual collection, textiles become soiled and misshapen, impacting their appearance and legibility. Accumulated grime that does not provide important evidence of use or context was removed or reduced through careful vacuuming, bathing, or spot cleaning. Creases and wrinkles which distorted the original forms were humidified and reshaped. 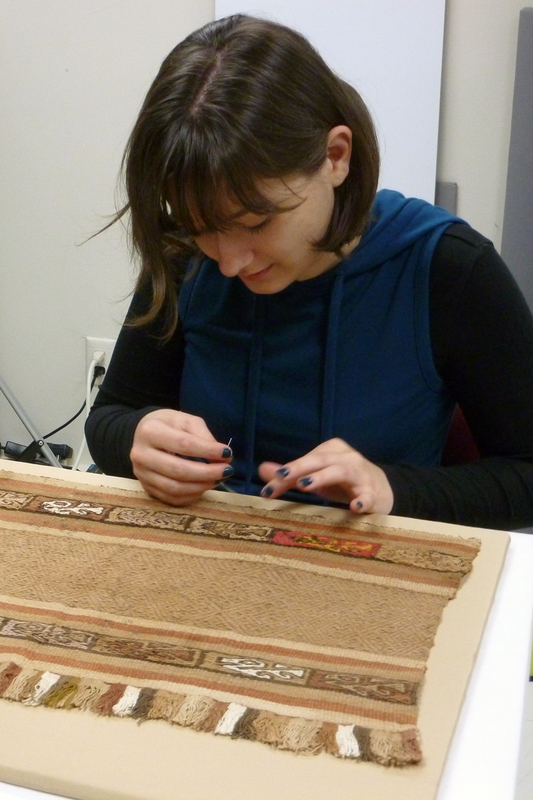 Conservation project intern Nysa Loudon stitches a Chimú brocaded textile fragment to fabric-wrapped support board. Photograph courtesy of Renée Stein. Over time weave structures often become weak or broken, compromising the physical integrity of the object and creating areas that are vulnerable to loss. Some fragile structures were reinforced, i.e. consolidated, by carefully inserting stitches of almost-invisible thread to secure loose threads and strengthen damaged areas. The principles of minimal intervention and reversibility guided every treatment, emphasizing long-term preservation in addition to aesthetic presentation. All interventions were documented to record treatment materials and methods as well as compile the results of examination and analysis. 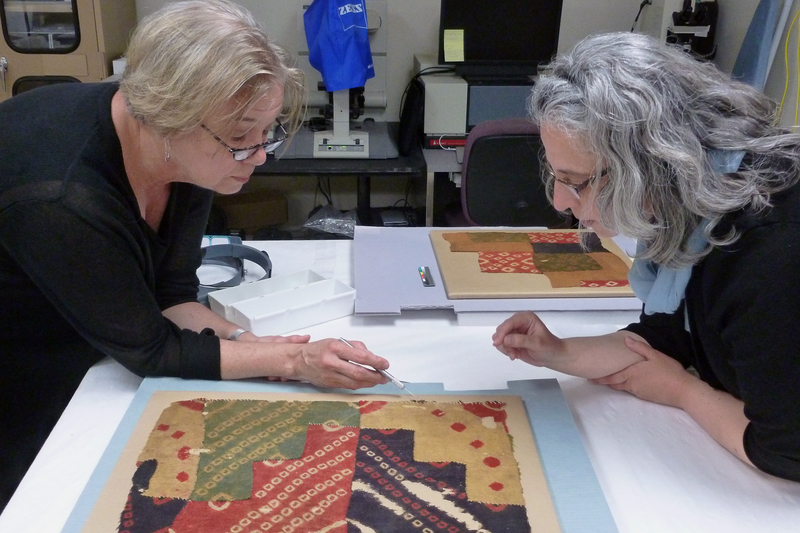 Chemist Dr. Ruth Ann Armitage and conservation scientist Dr. Cathy DeRoo examine the discontinuous warp and weft fragment to select samples for dye analysis. Photograph courtesy of Renée Stein. Because of their fragility, many of the ancient fragments required overall support. Some objects were completely stitched to fabric-covered supports made from lightweight aluminum honeycomb panels. Whenever possible, textiles were placed onto secondary supports without stitching or were stitched along only one edge to permit access to the back for thorough examination. Particularly fragile objects were first stitched to a sheer backing and then placed onto a rigid support, allowing the reverse of the object to be examined while still supporting the weak structure. The comparatively more intact modern examples still require proper mounting to prevent damage while on display. Many of these objects are large, and temporary mounting techniques enable these objects to be safely displayed and then re-housed for storage and future portability. Working together with the Exhibition Design department, objects were positioned on padded tubes or carefully pinned to sheets of dense foam to support their structures while also showing aspects of their design, construction, and use. Platforms, plexi-glass panels, and display cases protect vulnerable objects from dust and touching. The gallery lighting is set to low levels of illumination (approximately 7 footcandles/ 70 lux) to minimize cumulative exposure and the resulting damage to dyes and fibers. 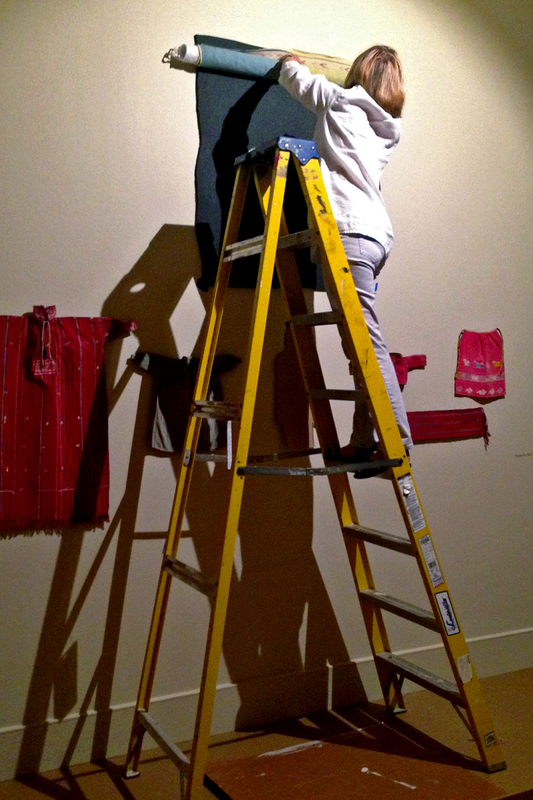 Textiles conservator Patricia Ewer unrolls and pins a modern Maya saint effigy’s saint's tzut (head cloth) to dense black foam secured to gallery wall. Photograph courtesy of Renée Stein. Technical investigation of art objects can reveal information about historic materials and working processes as well as use and condition, sometimes suggesting cultural choices, trade resources, or provenance. During examination and treatment, thread counts and weave structures were documented. Magnification, microscopy, and ultraviolet illumination helped to reveal information about construction methods, fiber types, and color. Dating and dye analysis were performed on a few select samples to address questions about age, materials, and manufacturing techniques.